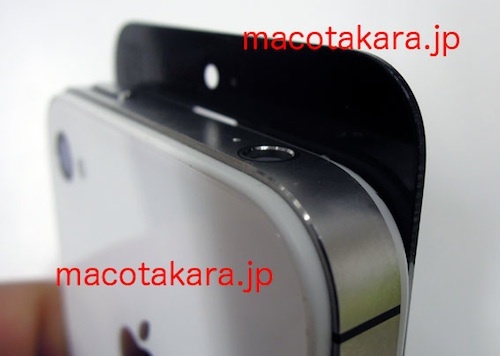 Following on from yesterday’s leaked iPhone 5 parts, Japanese blog Macotakara have released a convincing video that allegedly shows the glass panel from the iPhone 5. The glass plate is superimposed over an iPhone 4, demonstrating that the only change in physical dimensions is an increase in overall height. By making the iPhone 5 ‘taller’, the screen diagonal can be increased to 4-inches without adjusting the width of the device. Interestingly, towards the end of the video you can identify what looks like a QR code etched into the top right hand corner of the panel. What significance this has, if any, remains unknown. The video shows that the hole for the FaceTime camera has been shifted from the left-hand corner to directly above the earpiece, a subtle design change that parallels that seen in detailed iPhone 5 schematics also published by the site.